25 Best Iceland Waterfalls + Map of Waterfall Locations & Photo Tips! Iceland is a country with no shortage of waterfalls. We often remarked when driving around that some of the waterfalls that would be a top ten attraction in any other country, wouldn’t even make a top 100 list of waterfalls in Iceland! 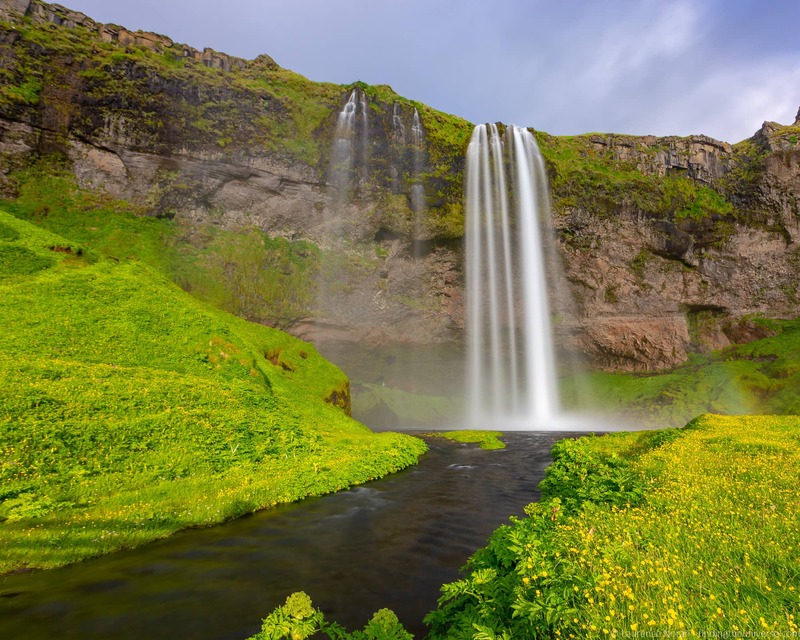 The reasons for Iceland having so many great waterfalls, likely numbering in the thousands, are largely climate related – the country’s northern latitude means that it has lots of rain and snow, and it also has a number of glaciers. Combine these facts with the mountainous landscape, and you have a country that is just epic for waterfalls. In this post, we are going to share with you what we think are some of the best Iceland waterfalls. This includes waterfalls all around the country. We had to make some tough choices as I think we’ve seen close to 100 waterfalls in Iceland! We’ll also share some tips for taking pictures of Iceland’s waterfalls, some planning advice for visiting Iceland, and a map of the waterfall locations. 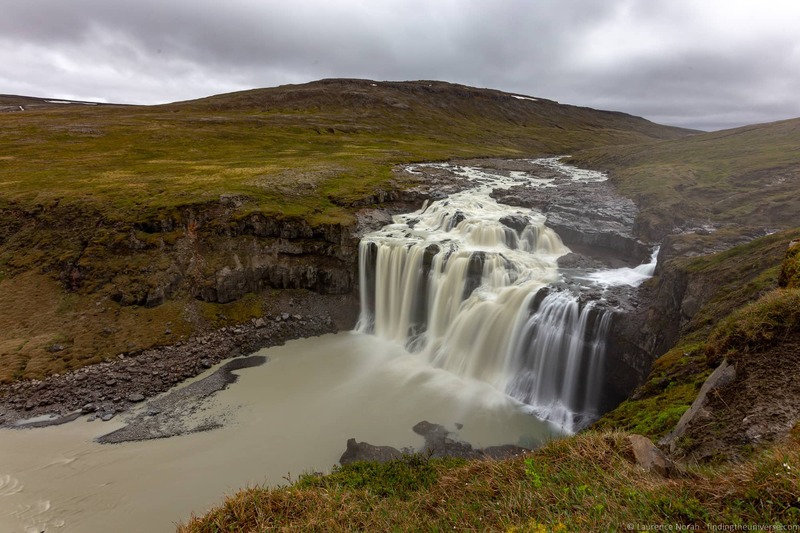 This list of waterfalls is in the order you would encounter them if you were driving counter-clockwise around the country, starting in Reykjavik. 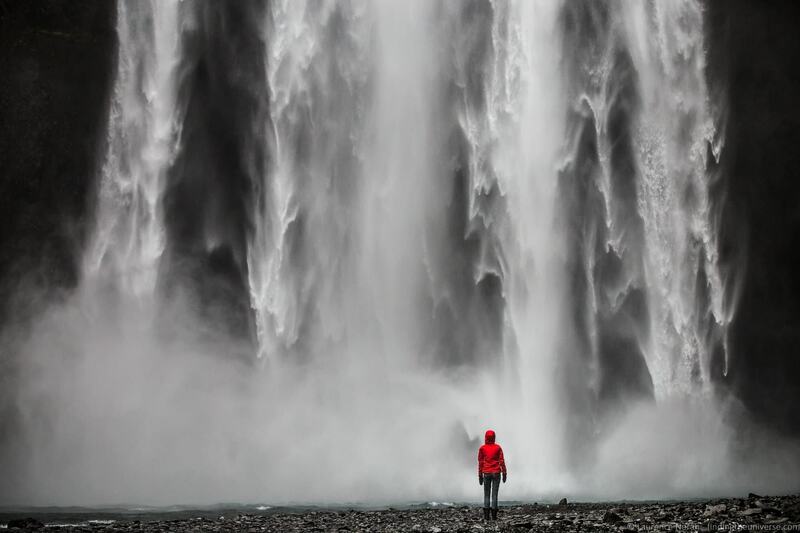 It’s not every waterfall in Iceland (that list would go on forever! 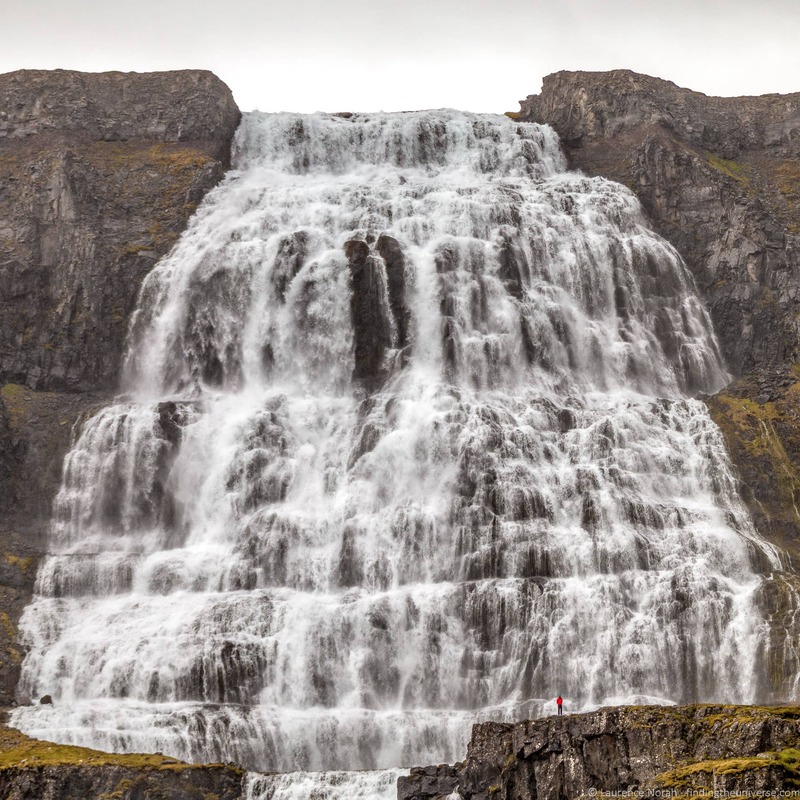 ), but we think it’s a pretty good list of some of the best waterfalls Iceland has to offer. We’ve also tried to focus on waterfalls that are relatively easy to access and open to the public, with clearly marked paths and good parking options, to make it easier for you to get to them. Although do note some may be inaccessible in winter or in inclement weather. This waterfall is just half an hours drive from Reykjavik, or a short five minute detour from Iceland’s Golden Circle on a gravel road. Despite its relative ease of access, this waterfall doesn’t get too many visitors, and we had it to ourselves for the half hour that we were there. It’s easy enough to see from the road with just a two minute walk. There didn’t appear to be a marked path down to the base of the falls that we could see, but it likely wouldn’t be too much of a scramble if you want to get closer photos. Öxarárfoss is in the Thingvellir National Park, which is one of Iceland’s more popular attractions, and forms a part of the Golden Circle route, which many travellers to Iceland do as a day trip from Reykjavik. As a result, this waterfall is definitely a popular attraction. This is for good reason – it’s only a ten minute walk from the car park, and it’s a very pretty waterfall. In winter in particular it becomes photogenic with all the ice that forms on the rocks around the falls. Another entry on the Golden Circle, Faxafoss, also referred to as both Faxi falls and Vatnsleysufoss, is an 80 metre wide waterfall with a relatively short 7 metre drop, and it’s a very photogenic stop. It’s a five minute detour from the main Golden Circle route, so many people miss it. It’s a waterfall you can get really close to, with good viewpoints available both right next to the falls, where there is a parking area, or from above on the road down. I preferred the view next to the falls personally, but you might have a different opinion. 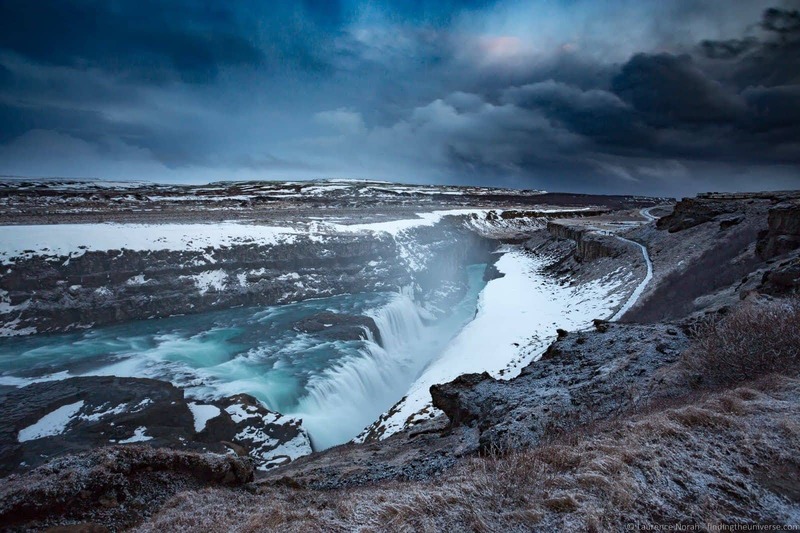 Gullfoss is probably Iceland’s most visited waterfall, if not one of the most visited natural attractions in Iceland. 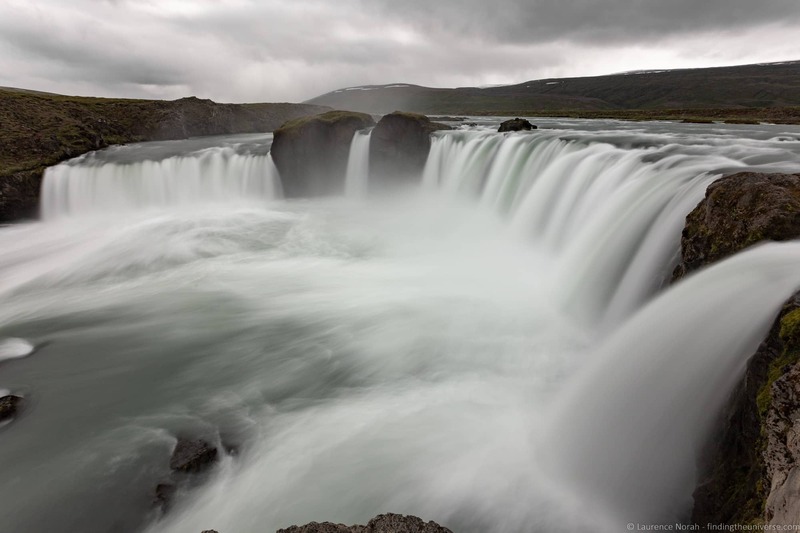 It’s a highlight of the Golden Circle, and is an easy waterfall to access from Reykjavik on a day trip. It’s also definitely one of the most impressive waterfalls in Iceland, and should make your short list of things you want to see in Iceland. 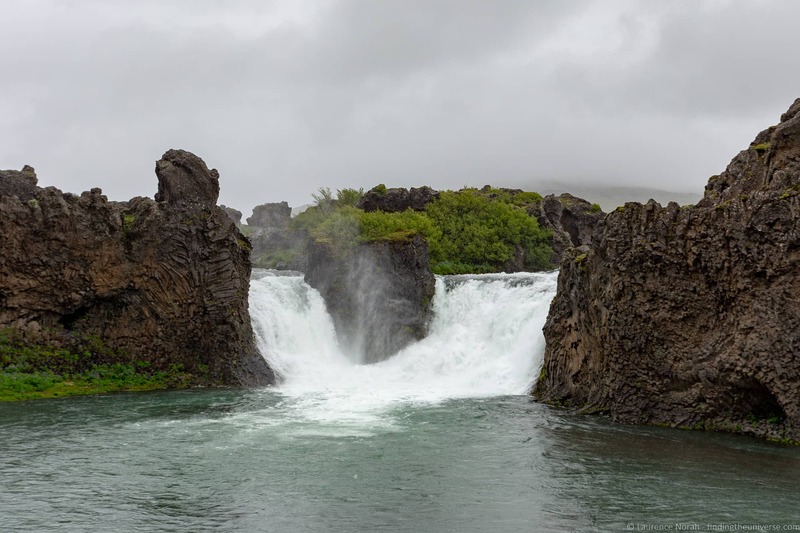 The falls, which are across two main tiers in a wide section of the Hvítá river, tumble a total of 32 metres. The sheer scale of this waterfall is what makes it so impressive – the width of the river makes for a seriously mighty waterfall. For a time, this waterfall and river were going to be used to create hydroelectric power. Whilst it would no doubt have made a lot of power, the natural beauty would have been spoilt. 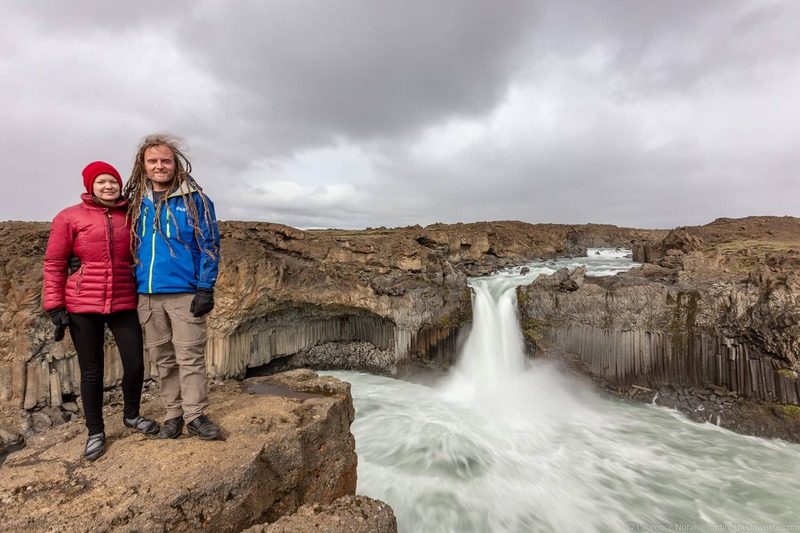 Thanks to the protests of locals, and in particular, Sigríður Tómasdóttir, the falls were not used for power, and remain as beautiful today as they have always been. There are multiple viewing areas across different levels of these falls, which are impressive in both summer and winter. It can be challenging to get the whole scale of the falls in, but we think the upper viewing platform offers the best views of the whole falls. If you come here in summer, you might be lucky enough to see rainbows form in the spray when it catches the light. We saw this in summer, which was lovely. Found in southern Iceland in the lava fields near Hekla, Hjalparfoss is a bit off the main tourist route, although it isn’t hard to get to. It’s impressive particularly for the basalt rock formations all around the falls themselves, and the main flow of the waterfalls is around a solid lump of basalt that bisects the river. We saw Hjalparfoss on a day tour out to Landmannalaugar, which also included Haifoss, below. As with most of the waterfalls so far, it could also be added on to something like our five day or seven day Iceland itineraries. A bit further along from Hjalparfoss is Haifoss. In a country filled with impressive waterfalls, I have to say that Haifoss is definitely up there as one of the more spectacular. With a 122 metre height, this is the fourth highest waterfall in Iceland, and the view of these falls from the viewpoint, which is just a five minute walk from the parking area, is absolutely incredible. Fun fact, when it was discovered in the early 20th century, Haifoss was thought to be the highest waterfall in Europe. That title actually goes to Vinnufossen in Norway, at a staggering 860 meters in height. Still, the name “High waterfall” stuck, despite it being in fact only the fourth highest waterfall in Iceland, and far from the highest in Europe. As you can see from the photo, despite us visiting Haifoss in summer, the weather wasn’t exactly ideal. Still, it didn’t detract from the majesty of the falls, which tumble into a deep gorge right in front of you. It’s also a two for one deal here, as you can also see the waterfall “Granni” from the same viewpoint. Granni means neighbour in Icelandic, as this is the neighbour fall of Haifoss. The track out to Haifoss, especially the last few kilometres of it, are a bit bumpy, and we’d recommend a 4×4 vehicle for this trek. Alternatively, pick a day trip from Reykjavik like this one, which when we took it included a visit here. Back on Iceland’s Ring Road, and you’ll come to another one of Iceland’s iconic (and well visited!) waterfalls – Seljalandsfoss. This is right off the ring road, and a very popular stop for visitors touring Iceland’s south coast. The waterfall pours off the mountain into a large pool, and is famous for being one of the few waterfalls in Iceland that you can walk behind. Doing so is definitely an experience, and offers a unique view of the falls, but you do need to be aware that there’s a lot of water spray here, and depending on the wind direction, you are liable to get very wet! So you’ll want to be properly prepared, both in terms of your clothing, and also protecting your camera or phone from the water. Note that it can also be very slippery! If you are driving yourself, note that there is a fee to pay to park here to visit the waterfall. Payment is by card machine on site, and is applied 24/7 all year. If you visit Seljalandsfoss, you should definitely take an extra twenty minutes to also visit Gljúfrabúi. 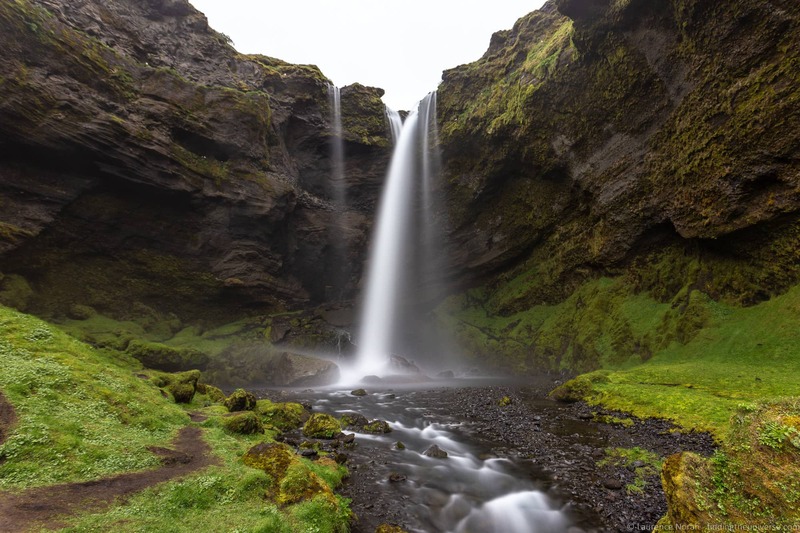 This is about a ten minute walk along a signposted and paved path from the Seljalandsfoss viewing area, and is a beautiful waterfall hidden inside a small canyon. It’s not quite the secret waterfall it once was, but access to it does require wading up a small river a few meters, which puts many people off. So you need to come prepared with waterproof shoes and clothing if you want to visit, and note it can be very slippery and you will likely get very wet! I’d definitely consider making the effort if the river level is not too high though, as this is a truly stunning experience, and you can feel like you are almost inside a waterfall, surrounded by green walls and crashing water. 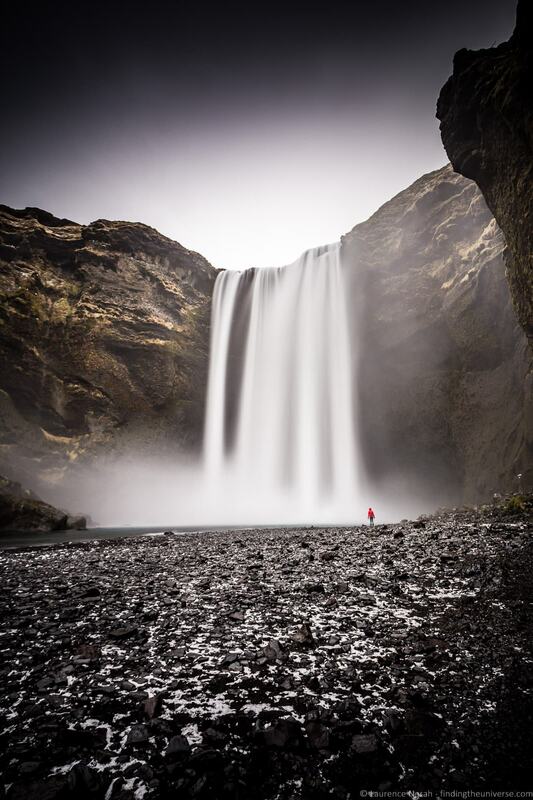 Half an hour further along Iceland’s Ring Road is Skogafoss, another of Iceland’s more well know waterfalls. I’d say that Gullfoss, Seljalandsfoss and Skogafoss are probably the three waterfalls that most visitors to Iceland will see. Skogafoss is impressive as the falls are wide and the drop is high. It also has two major viewing points – you can walk two minutes from the parking area to the base, where you can get very close (and also very wet) to the crashing base. Alternatively, you can climb up the staircase to the upper viewing platform for a different perspective. Skogafoss is popular for photos involving a person standing close to the base of the falls, giving the impression they are almost within touching distance of the water. This is achieved by using a zoom lens and having the photographer standing a bit further back, with a photography effect known as “compression” making the person seem closer to the water than they are. Note that there is normally a lot of spray here and if you get close, you’ll get very wet. Jess was soaked after this photo so come prepared in terms of clothing or don’t get too close! Kvernufoss is very close to Skogafoss, but is a lot less busy as it requires a bit of a walk. It’s also not well known or well sign posted. Kvernufoss is about a twenty minute hike from the Skogar Museum (definitely worth a visit as well!) car park, and the trail from behind Skogar Museum is easy to follow – take the ladder steps over the fence and follow the path to the gorge, then go up stream a little. Please note that as with much of Iceland, it is easy to cause damage unwittingly when visiting fragile spots like Kvernufoss, which do not have the infrastructure of more popular locations. To maintain this spot for future visitors and locals, please stay on the path (even if this means getting muddy shoes! ), so as to avoid causing any damage to the vegetation, and be sure to pack out all your trash. Iceland is a beautiful place, and we’d love for it to stay that way for a long time! Heading further along Route 1, you come to the massive Vatnajökull National Park, home to Iceland’s largest glacier. 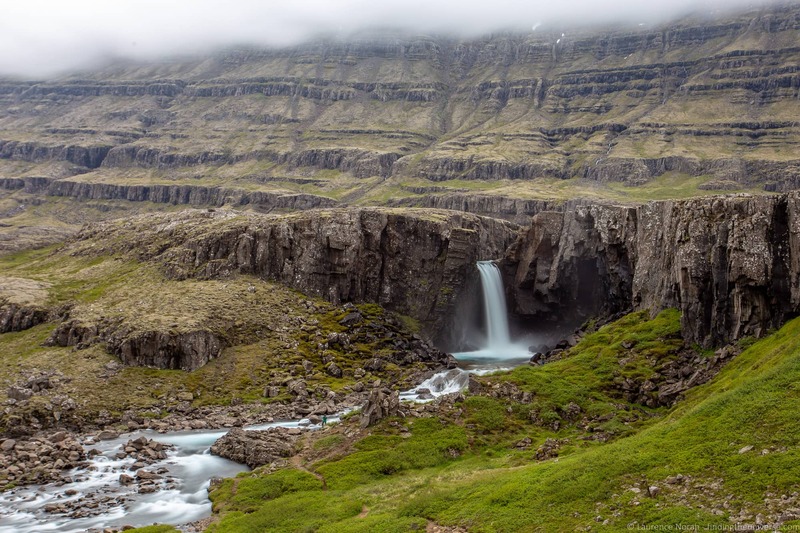 Naturally, where you have a huge glacier, you also have many waterfalls, and many of the waterfalls on this list are fed from this glacier and its outshoots. Svartifoss, or the “Black Falls”, are the first on this list. These are pretty falls that are notable for tumbling over a black wall of vertical basalt columns, which gave the falls its name. It’s a bit of an effort to get up here, involving a 45 minute hike (each way, likely a bit faster on the way down though!) up a fairly steep (but well marked) track, but the view is worth it. If you are up for a longer and more challenging hike, this is also where you would set off to for a view of Morsárfoss, Iceland’s tallest waterfall. You can get a view of this fall from Kristínartindar peaks, although you’ll want to bring binoculars, as it’s still 6km from the viewpoint to the falls. It’s much harder to get closer to Morsárfoss, as you have to hike over a glacier, which carries unique challenges and should only be attempted with experienced guides and specialist equipment. Our tour of Iceland’s waterfalls now leaves the south coast, and continues to east Iceland. This region of Iceland is much less visited than the south, but definitely worth exploring. 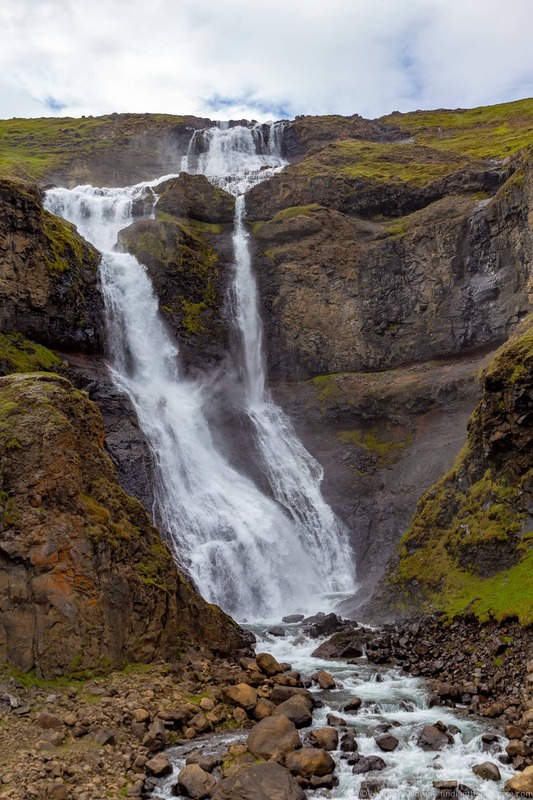 The first waterfall in the eastern region of Iceland on our list is Sveinsstekksfoss. This is just off the Ring Road, and whilst the fifteen metre falls aren’t necessarily hugely impressive, the beautiful geology around the falls, which have cut a winding canyon through the rocks here, meant that they were one of Jessica’s favourite waterfalls in Iceland. The main viewpoint is up a short and steep gravel road, which has a small parking area at the top. Then you go through a little gate to the viewing area, it’s probably less than a minute’s walk. A little further up from Sveinsstekksfoss is Folaldafoss. This is a five minute detour off the 1 down Route 939, which is a relatively easy to drive gravel road (for this short section at least). This is the last of a series of waterfalls in the Berufjarðará river, and the falls can be easily seen from the parking lot, which offers a great view of the 16 metre high falls, which force their way through a gap in the rock and plunge to the pool below. It’s also possible to hike down to the falls for a close up photo, and the walk down is no more than ten minutes. Both views are pretty good – personally I preferred shooting the falls from above, as you can include some of the surrounding landscape, which is pretty impressive, as part of the composition. We had the worst weather when we visited Klifbrekkufossar, with persistent rain and fog attempting to put a dampener on our visit. Despite the weather though, this waterfall was Jess’s favourite of all the waterfalls we visited in Iceland. It’s not the highest waterfall, or the greatest volume or water, or anything like that. But the multiple tiers of water here, and the lush green vegetation all around, combined with its relative remoteness, all combined to make this a pretty special place. It’s a bit of a detour to get here down a fairly rough and steep in sections gravel road, that we’d generally recommend only doing in a 4×4. It’s also likely to be closed in winter. The falls themselves are just off the road, and there’s a small parking area. We had it entirely to ourselves for the duration of our visit, which was around 30 minutes. Access it via a small path, and you can explore here a bit around the falls too. Just near the town of Egilsstaðir, at the start of the scenic road down to the pretty coastal town of Seyðisfjörður, is the parking area for Fardagafoss. This waterfall requires around a 30 minute upward hike, but the views on this hike are pretty epic, both back across the valley (home to Iceland’s largest forest) and also of the gorge that the river winds through on its way down into the valley. Even better, as you hike up to Fardagafoss, you’ll walk right past Gufufoss, another quite epic waterfall that is worthy of a few minutes of your time at least. You can get very close to Fardagafoss, but the last section of the walk is a bit tricky, with steep stairs and even a chain bolted to the cliff to hold onto. If you do this though, you can even make it all the way behind the waterfall, where there’s a small cave. This used to be a larger cave, said to be home to a troll, but it has collapsed in recent years. As a result, it isn’t quite as big as it used to be, and we’re not sure if it’s still a troll residence either. Hengifoss is Iceland’s third highest waterfall, measuring in at 128 metres in height. It’s also quite the geological snapshot, with multiple layers of a red coloured rock sandwiched between basalt layers in the cliff it falls over, reflecting a variety of different volcanic eruptions that have taken place in Iceland over the millennia. Hengifoss is around a 30 minute drive from Egilsstaðir, and then the hike up to the falls is around 2.5km. 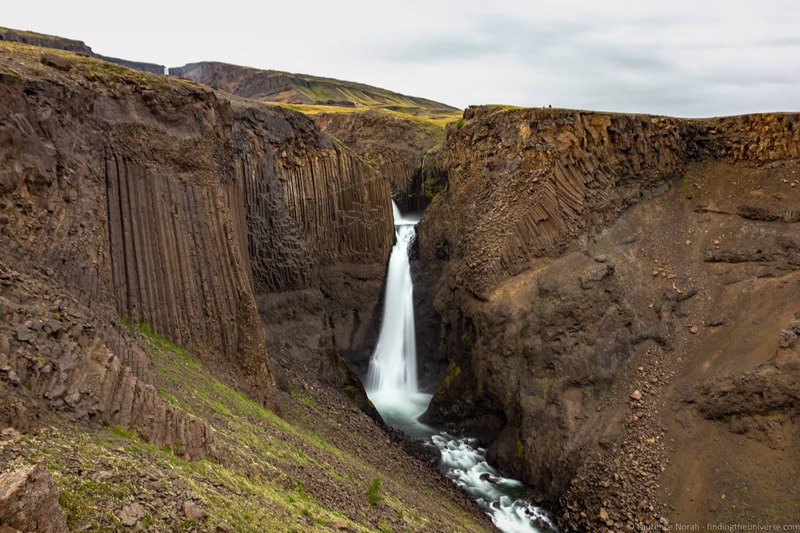 It’s pretty much all uphill, but you are rewarded along the way with a number of other impressive falls, including Litlanesfoss, which pours out over spectacular black basalt columns. When we visited Hengifoss, the trail ended before you could get all the way to the base of the falls, and landslips and floods from the water commonly wash out the track here. The view was still fantastic, and worth the hike, but it had to be appreciated from a bit of a distance. If you want a waterfall hike that carries the promise of epic views along with a thermal bath at the end of your journey, then Faxi is the waterfall for you. Also, I am aware that there’s another waterfall called Faxi in this list, but it turns out, a bit confusingly, that there are two waterfalls called Faxi in Iceland. I guess with so many waterfalls on offer, there just weren’t enough names to go around. Anyway, Faxi is a part of the “waterfall circle” hike in eastern Iceland. It’s way up in the highlands, about an hours drive from Egilsstaðir, and whilst the road to the start point of the road is paved, this area of the country is only accessible in summer. The road here is closed throughout the winter. We parked at Laugarfell, which is both an accommodation and a geothermal hotspring with two outdoor bathing areas. For this waterfall, I went hiking, and Jess chilled out with a book in the outdoor pool, enjoying the views. The route to Faxi took around half an hour, and on the way I passed another magnificent waterfall, Stuðlafoss. Faxi was definitely the highlight though, with a massive wide drop. It was also another experience I had all to myself, which seemed odd at the time because the waterfall was so big and impressive. Still, it does require a bit of effort to get to. 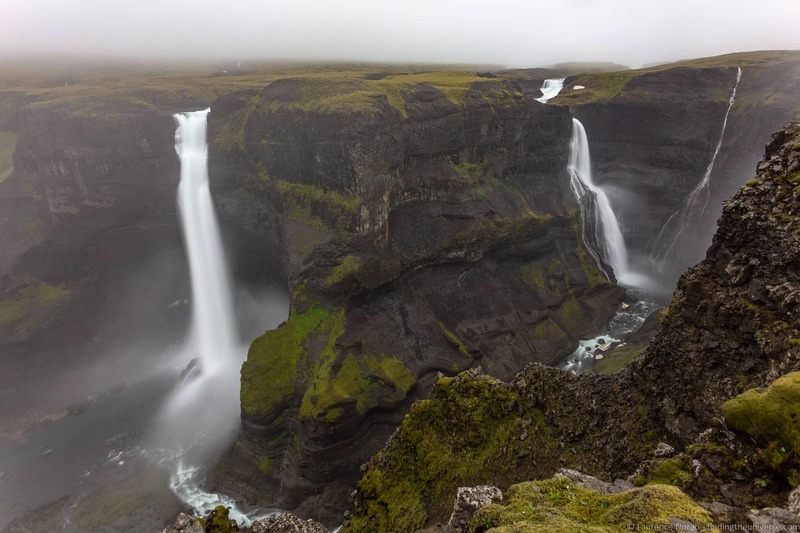 As well as Faxi, the waterfall circle includes the 40 metre high Kirkjufoss, and the whole hike is around 7km is length, or around two hours. I didn’t do the full hike as I was told it was a bit boggy, but the trail from Laugarfell to Faxi was well marked and easy to follow. Plus you get to have a nice thermal bath (fee to use bathing pools) when you are done! Heading up towards the north of Iceland, the first large waterfall you will come to will be Rjukandi. This is about a half hour drive from Egilsstaðir on Route 1, making it a good stop if you’re driving the Ring Road without too many deviations and still want to see a good waterfall. There’s a parking area off the road here and it’s a short walk up a well marked path to the main viewing area, although you can see much of the falls from the start of the path. This waterfall has a total drop of almost 100 metres across two sections, meaning it’s quite an impressive set of falls, and well worth the short stop. If you’re visiting northern Iceland, a stop at Dettifoss waterfall should be high on your to-do list. This is the waterfall with the highest volume of water going over it in Europe, meaning, as you would imagine, it makes for quite a sight. 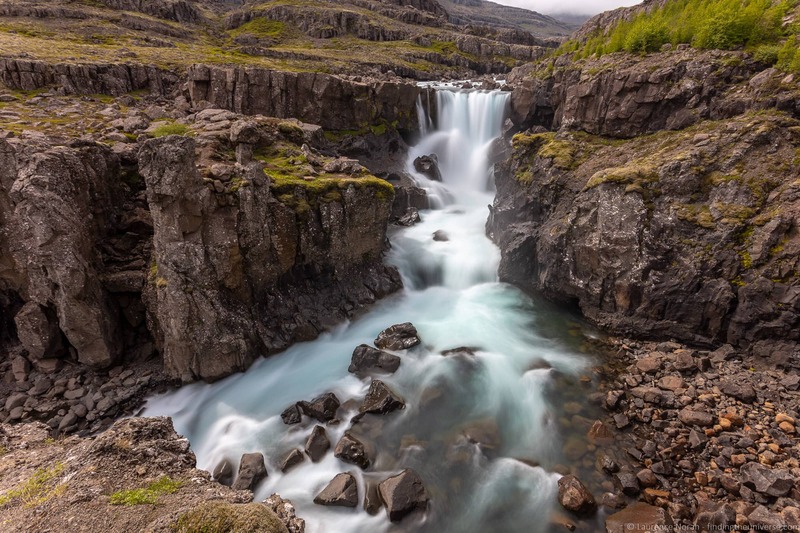 The falls are around a 30 minute drive north of the Ring road, and form a part of the “Diamond Circle”, a route of attractions in northern Iceland that forms a counterpart to southern Iceland’s Golden Circle. 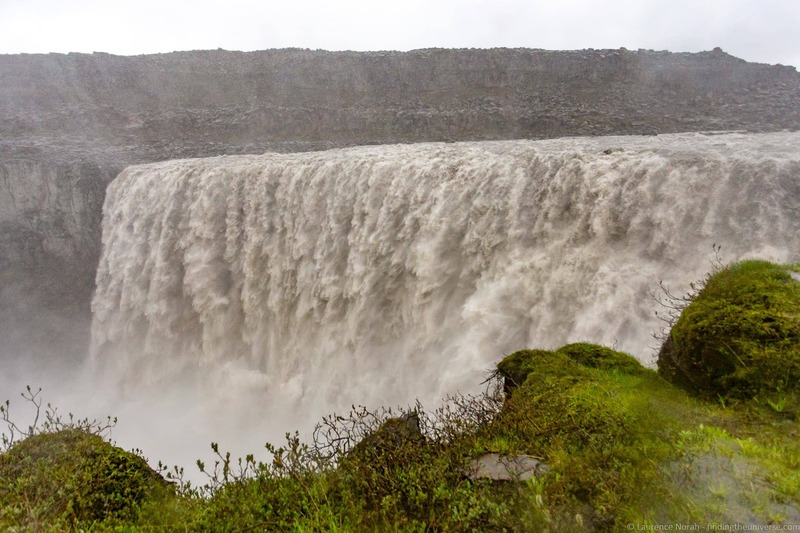 There are two major viewing areas for Dettifoss, and you will want to do a little bit of research before you visit as you have to choose in advance which one you want to see, as getting from one side to the other requires an hour long drive, meaning most people pick one or the other. We chose to visit the west side of Dettifoss, which offers better views of the whole waterfall and offers closer viewing opportunities. The east side allows you to see more of the drop, but not the whole fall. Still, both sides are reported to be good. It’s definitely worth remembering that the massive volume of water going over these falls results in a lot of spray. This was probably the wettest waterfall we visited in terms of how wet we got, with massive amounts of spray in the air making for challenging photography conditions. It was also raining, but to be honest, even if it hadn’t been, the spray would have soaked everything! If you want to see another waterfall in this area, it’s only around a fifteen minute hike up river to Selfoss from Dettifoss, which is another pretty waterfall, and since you’ve driven to Dettifoss, you might as well make the extra effort to see Selfoss as well! Note that Dettifoss is harder to visit in Winter as the roads can become more challenging to drive on and are sometimes closed. If you are visiting northern Iceland in winter and want to see Dettifoss, we’d recommend considering a tour like this instead of driving yourself. 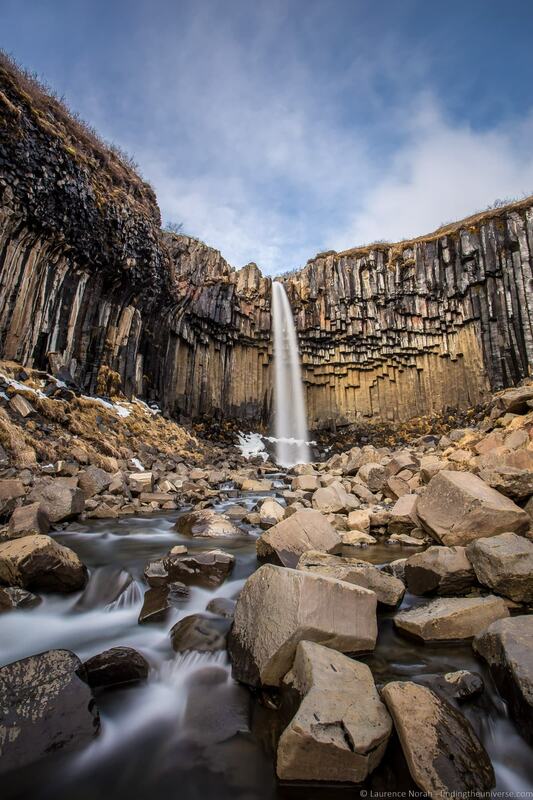 Aldeyjarfoss is another beautiful and relatively remote waterfall in Northern Iceland. The water shoots between basalt columns into a large circular pool, and the whole scene is wonderfully symmetrical, making for some good photography opportunities. It’s about a fifty minute drive south of the Ring Road, so is definitely not a minor detour. But waterfall aficionados with a 4X4 will definitely appreciate this unique looking 20 metre high waterfall. Note that in winter access can be diffcult without a good 4×4, and roads can also be closed. Much easier to get to than Aldeyjarfoss, Goðafoss is right next to the Iceland ring road, meaning it has many more visitors. It’s a large, horse-shoe shaped fall, and whilst the drop is only 12 meters, it’s 30 metres width and relatively high water volume make it a good stopping point. Goðafoss, which means waterfall of the gods (not a bad name we think), was apparently where the law speaker of the Iceland parliament, Thorgeir Thorkelsson, threw his Norse god statues, after Iceland converted to Christianity in 1,000 AD. This was how the waterfall got its name. Like Dettifoss, Goðafoss has two distinct viewing areas, one on each side of the falls. However, these are just a couple of minutes drive apart, and with the viewing area right next to the parking lots, there’s no reason you can’t visit both viewing areas if you want to. If you thought I might be running out of superlatives to describe waterfalls, you might be right. However, you have to believe me when I say that Dynjandi is without doubt one of Iceland’s most incredible waterfalls. Dynjandi is found deep in the Westfjords, a remote region of north west Iceland that many visitors never venture to. It’s the oldest part of Iceland, geographically speaking, and is home to beautiful and remote landscapes, as well as unique wildlife viewing opportunities. Anyway, back to Dynjandi. First off, Dynjandi is not like other waterfalls in Iceland. It’s a bridal veil style waterfall, which means it’s made up of thousands of little cascades that form a part of the greater whole. The top of the fall is thirty meters wide, and it widens to sixty metres wide at the base. The total distance from top to bottom is one hundred metres. Dynjandi is easy to view from the car parking area, but it’s worth taking the half hour hike up the hill to the base, to really take the scale of the falls in. There are also six waterfalls you’ll pass as you hike up, each impressive in its own right, but essentially paling into irrelevance once you get to Dynjandi itself. As you can see from our photo, we did not have the best weather for our visit to Dynjandi, but we were blown away by it nonetheless. If you can find time to come to the Westfjords when you visit Iceland, this should be on your list of things to see here. We’re now in West Iceland, and within easy striking distance of Reyjkavik, meaning we’ve almost completed our circuit of Iceland. Kirkjufellsfoss is definitely up there as being some of the most photographed waterfalls in Iceland, but this isn’t because this is a particularly spectacular waterfall. 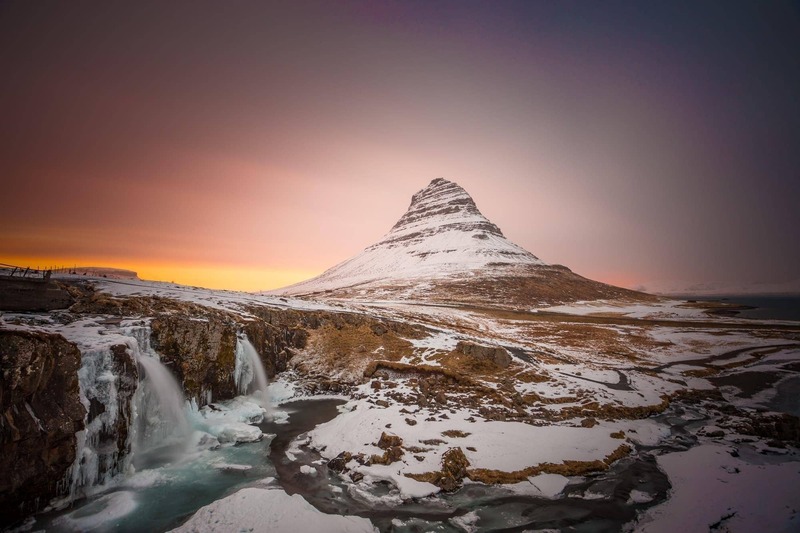 Rather, it’s because they form a handy foreground to the iconic Kirkjufell, the point mountain on the Snæfellsnes peninusla which is believed to be Iceland’s most photographed mountain. And pretty much every photo of Kirkjufell includes Kirkjufellsfoss. To be honest, it’s not hard to see why. It’s a beautiful location, and a wonderful shot, and it sums up for many people what Iceland is all about – beautiful nature. Getting here is easy, when you’re on the Snæfellsnes peninsula, the parking area for Kirkjufellsfoss is just a couple of minutes drive west of Grundarfjörður. The walk up from the parking lot is relatively easy, and it’s going to take you around 10 minutes. Just make sure you walk around the top of the waterfall so you can get the falls with the mountain in the back. Also, if you visit in winter, be careful, as the ground here can get very icy and slippery. I discovered this the hard way, by falling over, luckily without much damage! So I know I just said that Dynjandi is not like other waterfalls in Iceland. Well, I’m going to repeat myself. Hraunfossar is also not like other waterfalls in Iceland. Hraunfossar is a 900 metre long waterfall that pours out of the Hallmundarhraun lava field and down the side of the banks of the Hvita river. It actually comes out underneath the lava field, so appears to come from nowhere, and the rivulets of water flow down into the glacial blue water, creating a beautiful scene. The backdrop doesn’t hurt either, with the Langjökull glacier being visible on a clear day. Hraunfossar is just off Route 518, around an hours drive from Reykjavik. From the parking lot you can see the falls, and a two minute walk will bring you to another nearby waterfall of Barnafoss, which is your more traditional looking waterfall in a river and worth a visit as well. Last, but by no means least, of our favourite waterfalls in Iceland, is Glymur. 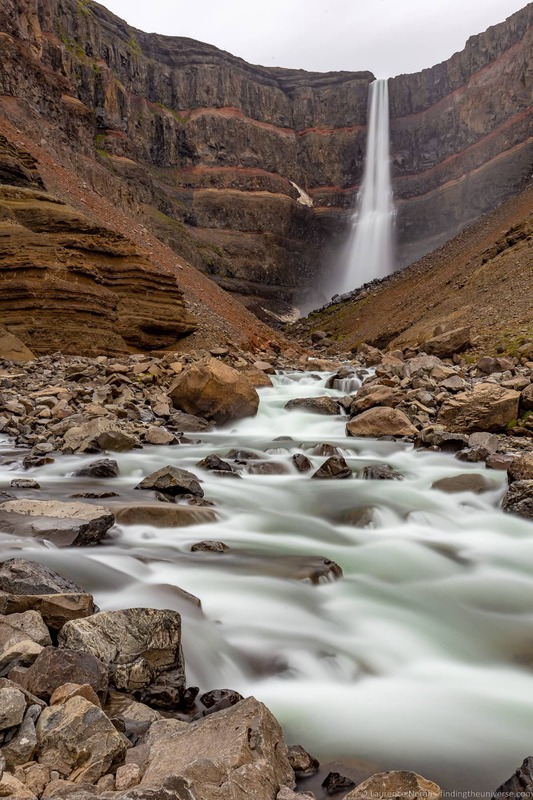 For a long time, this was thought to be the highest waterfall in Iceland, until a retreating glacier revealed the Morsárfoss waterfall, which stole Glymur’s crown in 2011. Still, at 198 metres in height, Glymur is still impressive enough. Plus, Morsárfoss is somewhat hard to get to, so for all intents and purposes, Glymur will likely be the highest waterfall most people have the opportunity to see in Iceland. It’s not all plain sailing though. 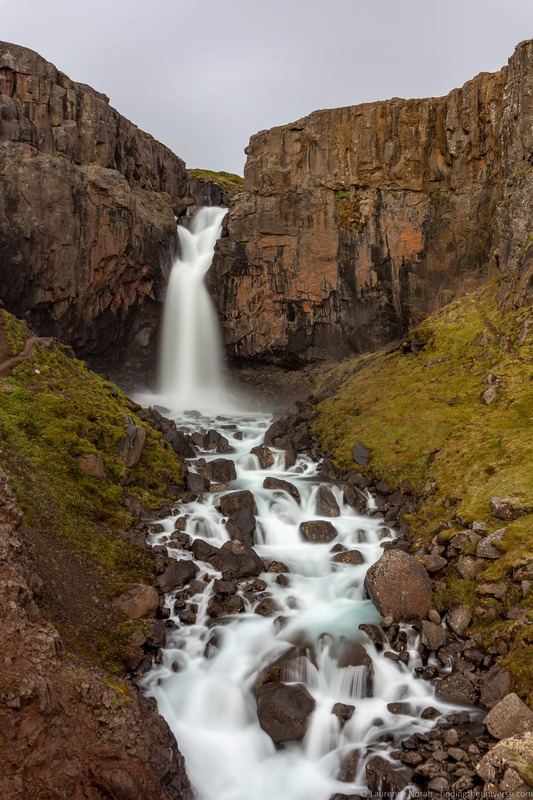 Of all the waterfalls in this list, Glymur is the most physically demanding to reach, as it requires at least an hour of hiking before you get to see it. This hike starts off quite easily, but to get to the best viewing point, you have to cross a river (this is only possible in the summer season as the log bridge is removed in winter), and then climb a steep series of paths, using various ropes and chains to make your way up. It’s worth it though. 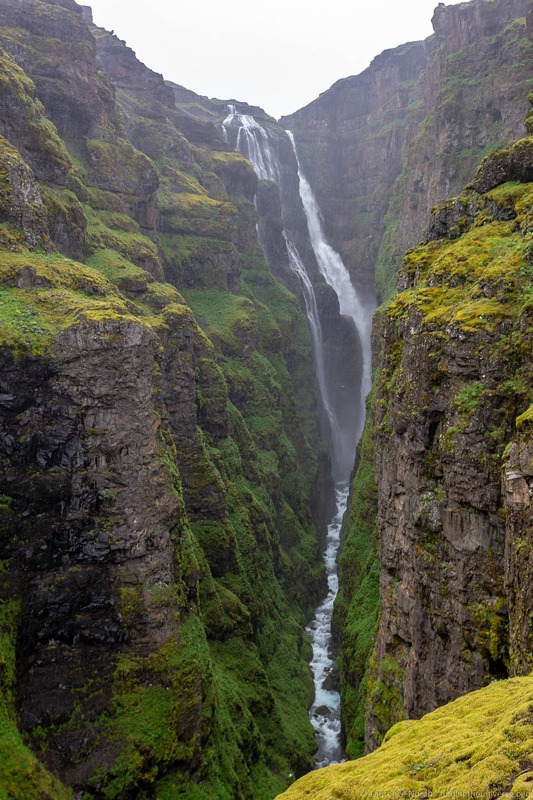 The gorge drops dizzingly off to your side, and you’ll have hints of the fall before you, but the ultimate reveal of Glymur as it drops almost 200 metres will definitely take your breath away. That, or the hike up will. I’ve done this hike twice, once in summer, and once in winter. In Winter, I was entirely alone, and I went up the side that didn’t involve a river crossing. From here I couldn’t see the entire fall, but I did appreciate the views (and the solitude). In summer, I crossed the river and hiked up to the viewpoint, which definitely offers the best views, but obviously there were many more people. The route can also be hiked as a circuit, crossing the river above the falls and coming back down, but I’ve not done that. From Reyjkavik, it’s around an hours drive out to Glymur, taking Route 1 and then Route 47. 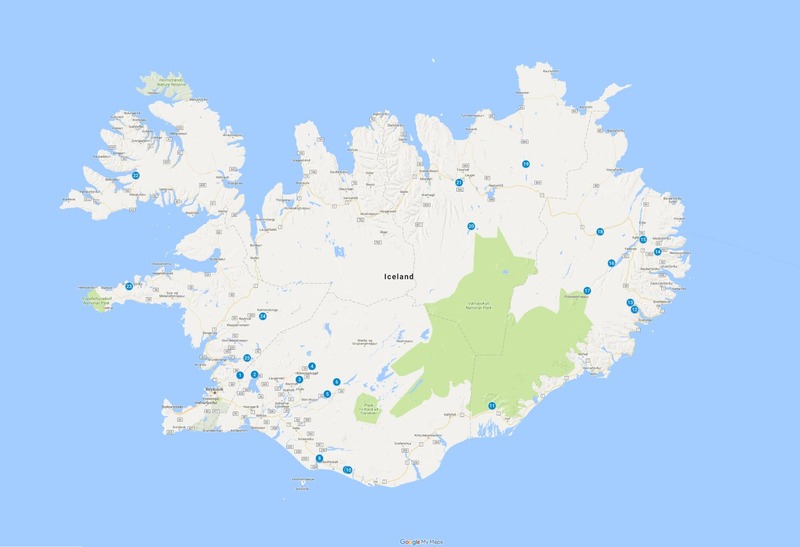 To help you out with planning your waterfall sight-seeing, we’ve put together map of all our favourite waterfalls in Iceland, which you can see on Google Maps here. To help you get some great shots of the waterfalls in Iceland (or waterfalls anywhere! ), I wanted to quickly share some tips for taking photos of waterfalls, as well as some of the photography gear you might consider using for your waterfall photography. Other than my camera, I’d say that a tripod is without doubt my most used bit of photography equipment, and one we take everywhere. For waterfall photography, a tripod is essential because it lets you take longer exposures, creating that soft looking water effect that you can probably see in many of these photos. That comes about from shooting with a slow shutter speed, usually between 1 second and 30 seconds. Holding a camera still for that long is basically impossible, so you need some way to keep it stable and avoid blurry images. And that way is a tripod! These come in a wide range of options across a number of budgets – check out our guide to picking a travel tripod for ideas to pick one out. If you want to take photos with longer exposures in the daylight, you are going to need a neutral density filter. These reduce the light coming into the camera, meaning that you can use longer shutter speeds even in the day time. I have a full guide to what neutral density filters are, as well as how to pick them, in my guide to neutral density filters. Iceland is a country where rain can happen at pretty much any time of year. Combine that with the amount of spray coming off the waterfalls you’re going to be photographing, and you are definitely going to need some way to keep your gear dry. Previous to this trip, I had been using just a clear zip-loc style bag over my camera, but this was definitely insufficient protection for the Iceland waterfalls and weather. As I did not have a great way to keep our gear dry, and despite our camera’s being “weather-sealed”, moisture definitely got in, appearing behind the screens, and causing the WiFi module to cut out on one of our camera bodies. Thankfully this all resolved itself once we got home, but we have since invested in some more effective waterproof covers for our cameras. We do have a backpack with a waterproof cover, but at some point you’ve got to actually get the camera out and shoot! So we now have these camera covers, which whilst not something you could go swimming with, certainly provide protection on shorter shoots. For smartphones or smaller compact cameras, you’ll probably just want a small dry bag like this. Taking pictures of waterfalls is no different to other kinds of photography, with composition being key to successful photos. You’ll want to think about the rule of thirds, use of color, reflections, symmetry, and consideration of your foreground, midground and background elements in order to get great waterfall photos. Getting your composition right is a whole post of itself, and is in fact one that I’ve already written – check out my guide to photography composition. Two factors that go towards great photos are having great light, and having patience. I’ve put these together, because I feel they go hand in hand. Sometimes, great light can be just a few minutes away, and it’s always worth waiting if it looks like the light might be about to improve. For waterfalls, patience is also a virtue as it can mean the difference between a shot full of people, and a nice empty (or less crowded) shot. Of course, the odd person in a photo can lend scale, but sometimes we want a shot without people. What I’ve observed from years of travel and photography, is that the majority of people don’t spend that long at a location. They arrive, see what they want to see, get some photos, and leave. So if you are at a location which is really busy, you might be able to wait the crowd out by just hanging around for a little while. Of course, this won’t work every time, and you might not always have time to do this, but if you aren’t in a rush, a bit of patience can be very rewarding when it comes to getting great photos. For more tips on photography, and to improve your photography in general, check out my detailed and comprehensive online photography course, which will have you taking great photos in no time. 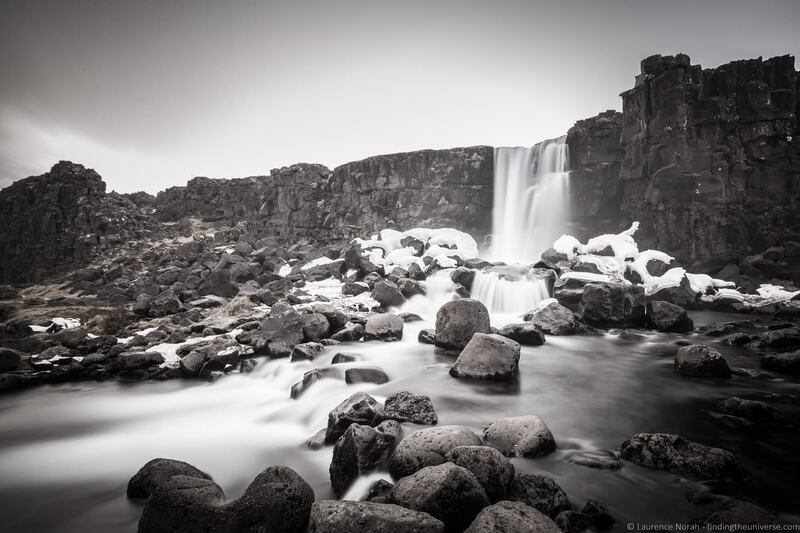 As you can see from the photos in this post, we’ve visited Iceland in both the summer and winter, and taken photos of waterfalls at different times of year in various kinds of weather. In the summer (June to August), you have much longer days and the chance for the midnight sun. The landscape is likely to be more lush and green and there is also a greater chance of it actually being sunny. Of course, as our photos show, this certainly isn’t guaranteed! Summer is also a more popular time of year to visit Iceland, so many attractions are likely to be busier. Winter (roughly December to April) is a less popular time of year to visit Iceland, but much of the country is harder to access due to snow and ice. Although less crowded, the waterfalls around the South Shore and West will still be busy. Many of the waterfalls on this, particularly those in the high country, will either be inaccessible, or you’ll need serious equipment and expertise to get to them. Alternatively, you’ll have to book a tour. The shoulder months can vary, with snow still a possibility in May, and from October onwards. However, the days are still relatively long at this time of year, and the climate will be a bit milder than winter. 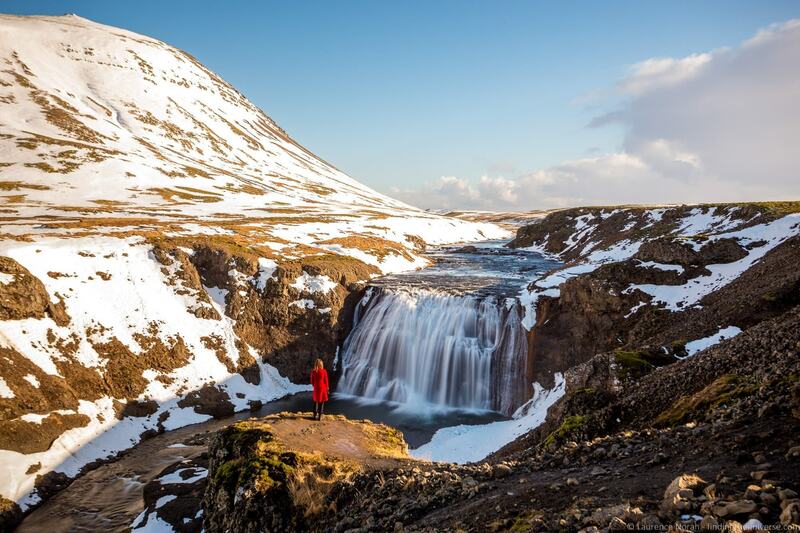 We think all times of the year are good for visiting Iceland, but we recommend summer if it is your first time to Iceland as more attractions will be open, roads are more accessible, and you have better chances for good weather. However, no matter when you go, you just have to plan accordingly and be realistic about what is going to be achievable. As you can see, the waterfalls we’ve recommended are all around Iceland. If you want to visit a lot of waterfalls all over the place, the best option is going to be to hire a car, and drive yourself around. Check out our guide to planning a trip to Iceland for advice on how best to do that. 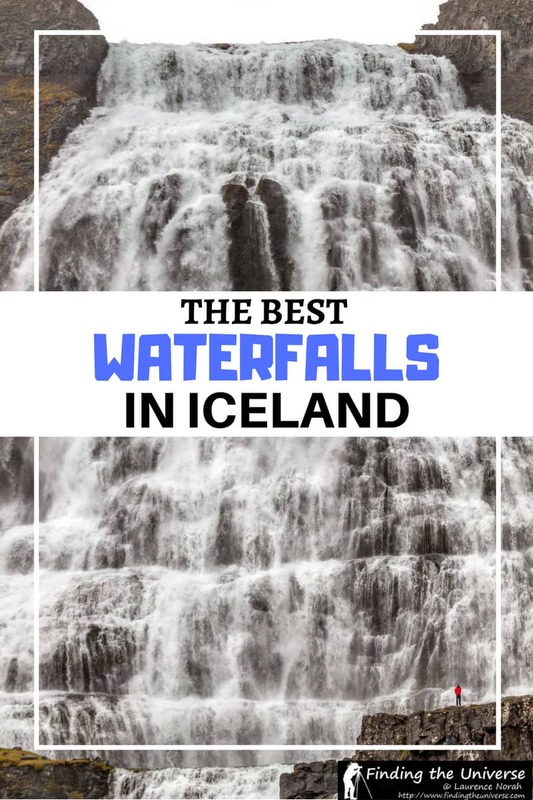 Of course, you probably don’t have to visit all the waterfalls in this list, and indeed, if you visit Iceland in winter, many of them become hard (or impossible) to access. 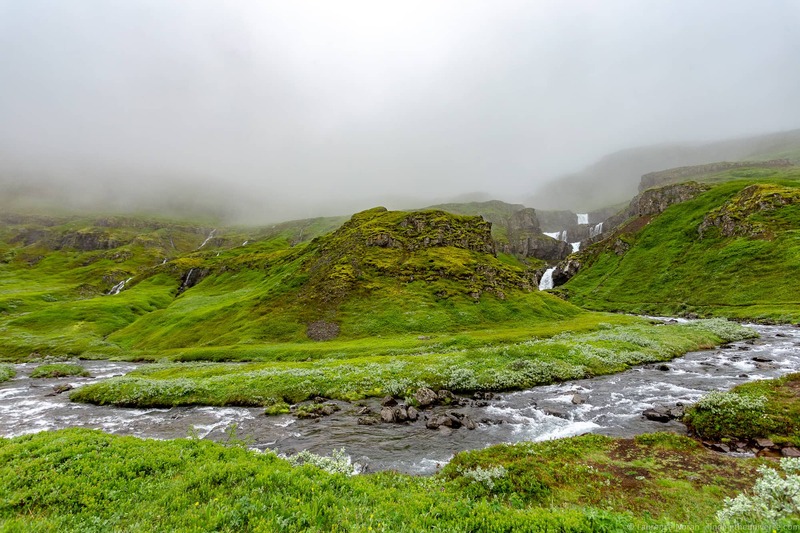 As such, you might want to focus on one area of Iceland for your trip, which we’d definitely suggest if you have a week or less in the country. 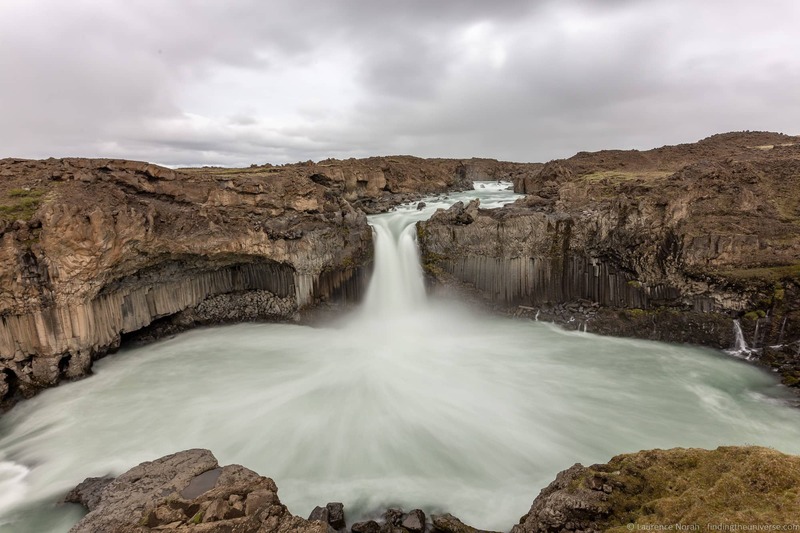 If it’s waterfalls you are particularly interested in, looking at our map, the southern half of Iceland has the greatest concentration of waterfalls, and this is also the area of Iceland most well served by various day tours of Iceland and group tours of Iceland. We’ve got a five day and a seven day self drive itinerary that cover the south of the country, which cover most of the waterfalls in this list. You can also add a few more to these itineraries if waterfalls are a focus for you. There are also a number of group tours covering the south we can recommend, many of which include at least some of these waterfalls in their itineraries. For example, this two day tour of southern Iceland which includes the glacier lagoon, and this one which includes seven waterfalls and an ice cave. 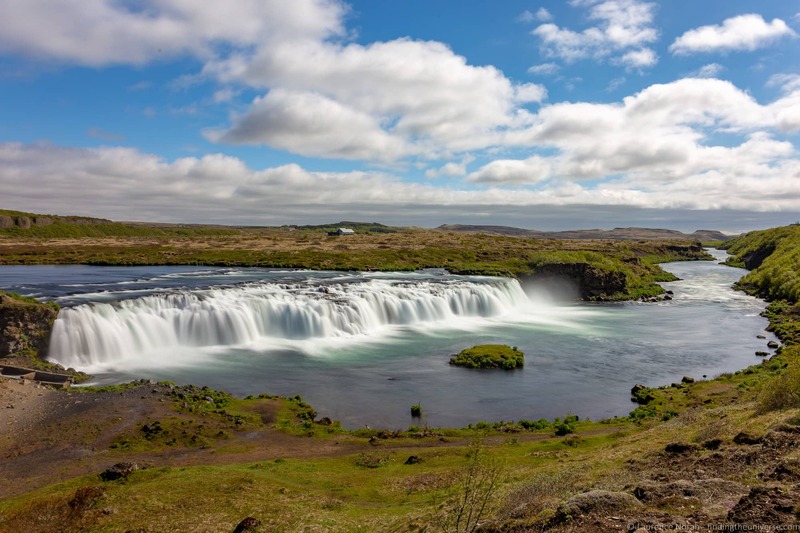 If you want to see more of the country and have a bit longer, this 9 day Iceland complete tour (summer version here) will get you to many of the most spectacular waterfalls in this list, as well as lots of Iceland’s other major attractions. 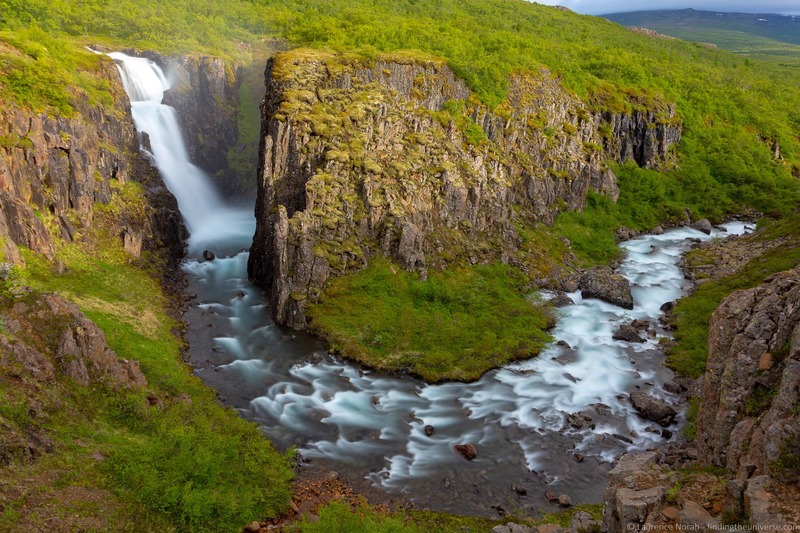 There’s also this tour, which focuses on some of Iceland’s more spectacular wilderness areas. We’ve travelled a fair bit in Iceland, and have written a number of guides to help you put together your trip and plan effectively. We think you’ll find them useful. We have a detailed guide to help you plan a trip to Iceland, which has everything you could need to help you plan an awesome adventure in Iceland, from budget tips to practical information and more. A must read and a good place to start your trip planning! We have a detailed post outlining a 7 day winter Iceland itinerary to give you some route ideas. If you are interested in seeing more than waterfalls, and are visiting at the right time of year, check out our detailed guide to Puffins in Iceland, which has everything you need to know! We travelled with Iceland Travel – check out their website for lots of different tour options and prices. The weather in Iceland can be fickle – the best website for real-time cloud cover is this one from the Icelandic Met Office. 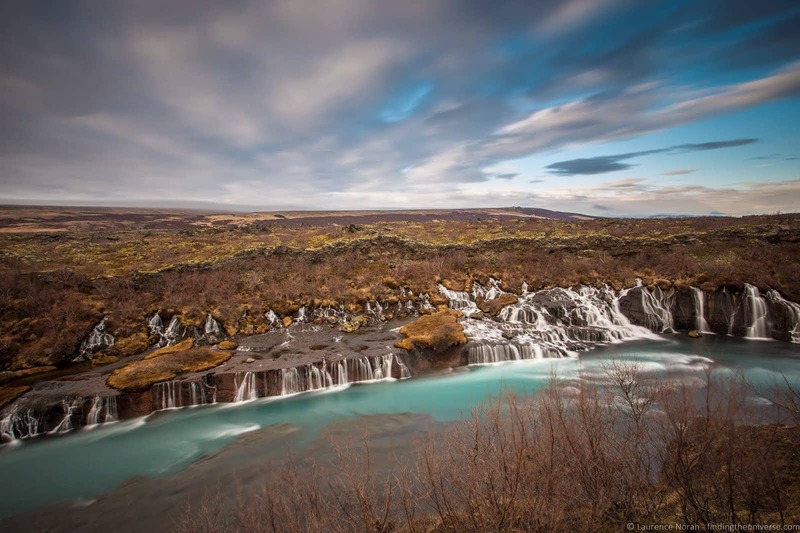 Hopefully you found our guide to what we think are the best waterfalls in Iceland useful! 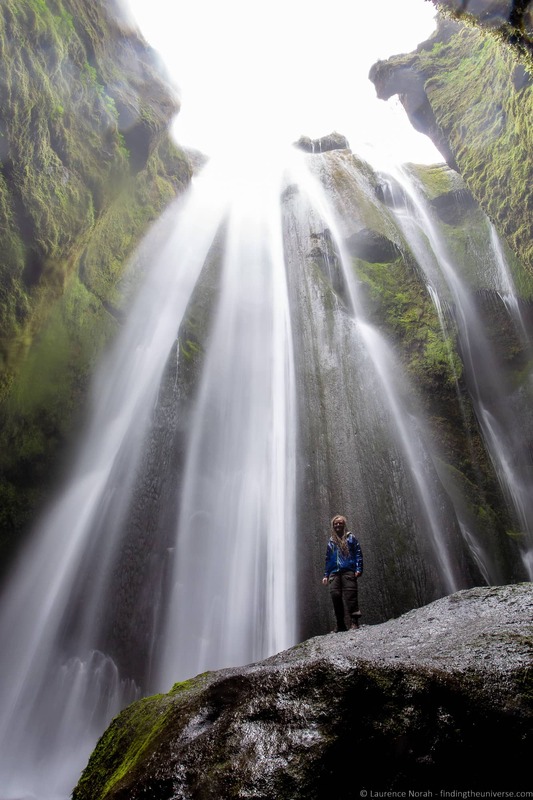 Do you have a favourite waterfall in Iceland from this list, or one that we missed? 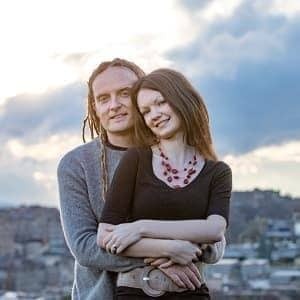 Any questions about travelling in Iceland? As always, just let us know in the comments below!